The cinema industry faces unprecedented competition from on-demand and streaming media, and is heavily investing and promoting itself to stay relevant for the “Netflix generation”. At CineEurope, NEC together with Beaver Group will be demonstrating how cinema operators can deploy a range of technologies to create unique, engaging digital experiences that will recreate the magic of the cinema experience for every visitor. 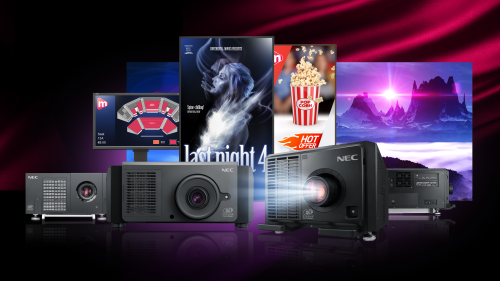 At Suite C, NEC will be showcasing a range of technologies for the cinema industry, including the latest RB cinema laser projectors, wall-mounted and table-top touch screen displays, impressive video walls and direct view LED digital signage. These technologies are already being used to create an immersive, interactive experience – for example, by enabling movie-goers to order tickets and snacks from touchscreen, watch high-resolution film trailers in the foyer or in the auditorium while they wait for the film to begin, and view breath-taking video walls. “Cinemas need to make themselves relevant to a new generation of people who expect high-quality digital experiences wherever they go,” said Mark Kendall, Business Development Digital Cinema at NEC Display Solutions Europe. “Going to the cinema should be about much more than just watching a movie. Embracing digital display technologies throughout a venue enables cinemas to create an engaging, immersive experience, allowing venues to create the “wow factor” needed to attract more people to visit cinemas. To arrange a visit or a briefing, or to discover more about NEC at CineEurope 2018, contact the press office. Follow us on Twitter at @NEC_Display_EU to keep up-to-date with all NEC Display Solutions news in EMEA. To find out the latest from the event, keep an eye on the hashtags #CineEurope2018 and #CineEurope.